BUFFALO RIVER - Website of Outdoor Sports New Zealand! Buffalo River has been supplying hunters, sportsmen and farmers with a range of shooting accessories since 2001. Today Buffalo River products are available in over 40 countries worldwide. 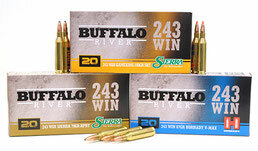 From gun safes & bipods, ammunition to hunting knives, Buffalo River have you covered. The Buffalo River .308 Win round is manufactured in Australia using the highly acclaimed and time-proven ADI propellants. The round exhibits consistent velocity across extreme temperatures, both hot and cold, while delivering accurate and highly effective performance to eclipse the game. The shooters at ADI range-shot the round over several 10-shot groups at 100m on an open range and produced group sizes less than half MOA. The 223 would be one of the most fired cartridges in New Zealand. Shooters are always looking for quality, accuarate, reliable and affordable ammuniton for their 223's. Buffalo River has provided this with our line of 223 ammuntion, Made in Australia. The Sierra BlitzKing bullet used in this ammuntion has long been a favourite of professional shooters in New Zealand, for its performance and consistency. Sierra BlitzKing bullets are the world’s most effective bullets for predator and varmint hunting. A thin jacket provides outstanding accuracy and the explosive expansion you need! Loaded With 55gr Sierra Blitzking Projectiles Which Carry A B.C. Of .271 Traveling @3200fps. 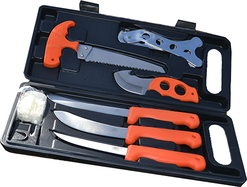 The staple for any decent hunting kit, a reliable array of hunting knives. That's where Buffalo River comes in. A wide range of knives to cover all hunting applications has been developed to give kiwi hunters plenty of choice. Most Firearms users wanting to safely or discreetly carry their firearms to the range or the field will appreciate the features offered in these gun bags. The external construction is Ballistic Nylon, the handles have been sewn on using angles that keep your firearms balanced within and the internal lining is a not rip nylon.